After stopping off at the home of a lady that lives close to my house to see what was wrong with her power wheelchair. Fernando, Calin, and I headed for Hermano Pedro. Three of the volunteers had asked if I would meat with them today so that we could take a few kids out to lunch. As I was pulling up to the orphanage I got a phone call from Paul Smit asking if he and his wife could join us. The nine of us were soon on our way to Camperos with 8 of the kids from Hermano Pedro. Today all but one of the kids that we took were easy to feed. Dennis who can only drink from a bottle was the only one that can not eat regular food. I had not intended on taking him but he is a favorite of both Calin and Fernando. They sat on both sides of Denis and spoiled him rotten. Denis absolutely loved it. I wish that every one that works with kids could take lessons from Fernando and Calin. 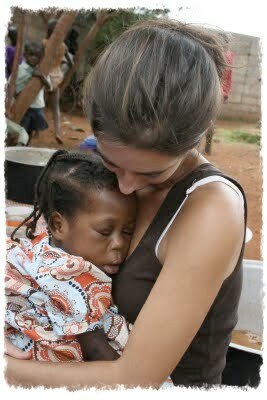 They have a love for these kids that radiates and it seems to work miracles. I have seen them feed kids that normally eat very little 2 helpings of food. After lunch we took the kids onto the playground equipment and they had a ball. Moat of them have to be carried up the ladders and laid on the slides but all of them love it. We always try to put the more timid ones on the slide right after one of the kids that has a wet pants has gone down. They slide down much slower if the surface of the slide is wet. 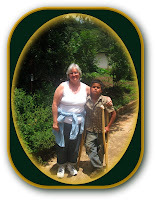 After returning to the orphanage I managed to fix a few wheelchairs then we headed for home. Tonight we had toasted cheese sandwiches and reefried beans. The ten of us polished off everything in record time. Poor Alex and Elder had to stand out by the gate and watch. I almost broke down and brought them out some food but since there mother was punishing them for skipping church and lying to her I wanted her to know that I stood behind her on her decision. As I write this my house and yard are filling up with more kids so I guess I better go out and spend some time with them. This morning I borrowed the Toyota pickup from Gordon. Then Calin and I met Eric and Hector at Burger King. They have been helping Paul with the bathroom that we are building for Maria’s Grandmother. Up until today I had not been able to help them due to other commitments. The 4 of us were joined by a block layer that lives in the Aldea where we are building the bathroom. Some of the relatives of Maria also helped us today. You wouldn’t think that a 10 X 10 cement building would take all that long to build but everything from digging the septic hole to mixing the cement has to be done by hand. This family is very poor and survives mostly on what they can grow on their small plot of land. Never the less the are always willing to share what little food that they have with us. Some of the fruits and vegetables that they give us are a bit unique but because of the grateful manner that they are given to us we seldom turn them down. Today I went into the dark little dirt house where Fidel is confined to a bed. As I sat and visited with him Grandmother came in to see how he was doing. After wiping his face with a damp cloth she sat down on the edge of his bed and started to cry. Just a few months ago Fidel's sister died and grandmother knows that Fidel is also dying. Grandmother herself is having a lot of trouble with her legs and is finding it more and more difficult to walk. Considering how much this family has been through it is hard to believe how they can stay so positive about life. Maria who can scarcely walk with the aide of a walker is always smiling. Grandmother who’s husband and most of her children disappear during the civil war still remains a warm and friendly woman. Even the kids who were extremely shy at first are now very outgoing and a lot of fun. We worked until 4 PM and then headed for home. Even though most of the people that we have met have seemed quite friendly we have been told that it is wise to be off from these roads before dark. A while back Hanna’s (Chris and Donna’s daughter) brother in law was shot at while riding his motor cycle in this area. He laid his motor cycle down on the dirt road and ran into the woods. No one came after him but he never saw his motor cycle again. When we arrived back at Chemaltenango the 4 of us met Gordon at Camperos and after having something to eat Calin and I brought Eric to where he stays in Guatemala City. You would think that most of the kids would have gone home by 9 PM but there were still several that I ended up feeding when I got back home. Even though Calin had eaten supper with me before bringing Eric home he too was once again hungry. I worry about how much he eats and how heavy he is getting and try to get him to eat more salads and things like that. He is good about eating the right food when it is offered to him but within a few minutes of finishing up something healthy he is once again eating junk food. I think that he is trying to make up for a few years ago when he often went hungry. Well the house has emptied out so I will once again say goodnight. Candy, the lady that was shot and paralyzed by her boyfriend called me a few days ago her power wheelchair is still giving her some problems. Abner, Fernando, and I stopped off at her home and repaired it on the way to Hermano Pedro this morning. Candy is not in good enough physical shape to attend a 5 day camp but has agreed to come there and talk to our campers. I think that she will be a real inspiration to them. She has been through a lot but her strong faith has kept her going. 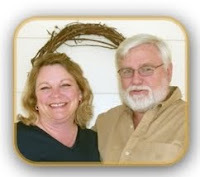 Her warm personality and positive attitude make each visit to her home an enjoyable experience. How some one can have so many negative things happen to them and still smile is truly a gift from God. 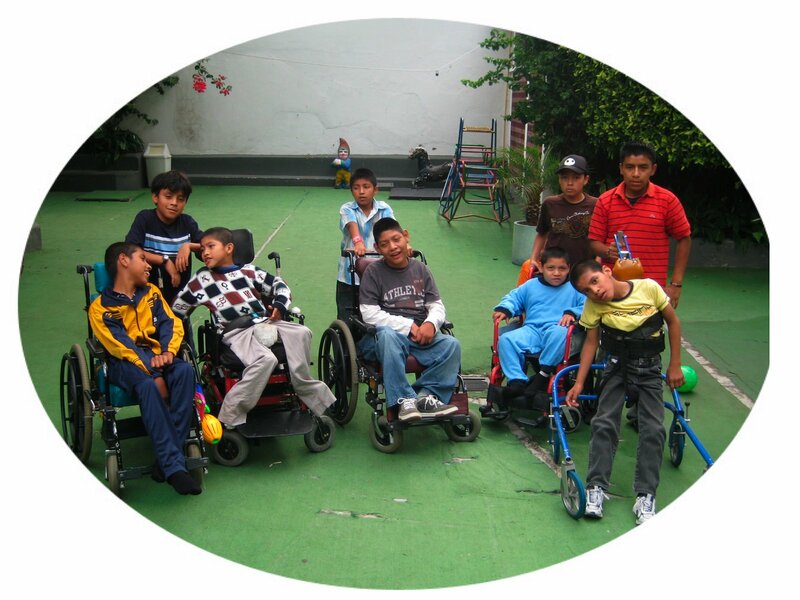 After we had repaired the wheelchair it was hard to say good bye but I had promised a few volunteers at Hermano Pedro that we would take some more kids out for lunch today. It was nearly noon when we reached Hermano Pedro so I quickly got the needed paper work done and soon 3 volunteers, Abner, Fernando, and myself were on our way to Camperos. Several of the kids that we took for lunch today were ones that do not get out often so they really enjoyed it. All 6 of us that took them had a great time to. After eating we went into the room that has the playground equipment. 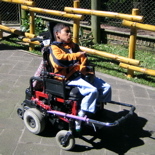 As we were getting the kids out of their wheelchairs and putting some of them on the slides I noticed that Diego did not look well. At first I thought that he was choking on something but he had gotten so excited that he was hyperventilating. I quickly took him outside while the others started to get the kids back into there wheelchairs. Once I got him to a quiet place I took him out of his wheelchair and held him. It took some time before he calmed down but a short time later he was once again laughing and having a great time. I usually take one less kid than the number of helpers that I have just in case we have an emergency but today I had not. I think that I will from now on when ever the group is larger than 2 or 3 kids. 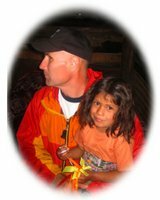 One of the head people from the orphanage approached me today and apologized for the hassle that we have been getting in trying to get Sonia into a school in Antigua. She told me that most of the staff at Hermano Pedro are 100% behind us but there are still a few people there that think the kids should stay locked up. She assured me though that most of them are trying their best to see that the kids have more freedom. I had been praying for a long time for the opportunity to share a few Ideas that I had but knew that since I am not an employee of Hermano Pedro I had to be careful what I said and how I said it. This seemed to be the right time. To my surprise she seemed to like some of the suggestions that I had. She asked if it would OK if she presented them to the father superior. I know that she is highly respected by him and perhaps since they will be coming from her the kids will eventually not be locked in their cribs so much of the time. More kids than ever tonight and more food. Calin and Abner are still here and by the looks of it I better lay quick claim to the bed, so I will once again say goodnight. I managed to have the house to myself for over an hour this morning. I think that is a new record for the month. I am trying for an hour an a half tonight but so far in the first sentence and a half I have had to see who was at the gate twice already. At around 10:30 I got a call from Candy. She told me that she was still having some problems with her power chair. Calin and I stopped in to check out what was wrong on our way to Hermano Pedro. Fortunately it was only a bad electrical connection, so we soon had the problem fixed. I had promised Moises and Byron that I would let them come to my house to fly kites and play with the kids after Church this Sunday but that was before I realized that Windy was celebrating her 15th birthday on Sunday. Here in Guatemala a girls 15th birthday is a big occasion. Often the birthday party resembles a wedding only there is no groom. Hopefully not any way although some of the girls do get married at a verry young age here. Anyway there was no way that I could miss her party so I decided to let Moises and Byron come over today instead. Before going home we stopped off at the new maul for some food. Even though Byron and Moises resemble a small train when Byron tows Moises’ wheelchair behind his power wheelchair, the 2 boys were intrigued by a small train that you can ride on at the maul. After lunch Calin got on board and helped balance both Byron and Moises as they went for a train ride. It is pretty hard to get a kite flying in my yard because 15 foot cement walls do strange things to the wind. Several of the kids offered to launch them from my roof and then hand the strings down to Moises and Byron so that they could have the experience of flying one. I warned them to stay away from the razor wire that the neighbor to the south of me put on the top of the wall. She claims it has no electricity running through it but we have found dead cats on my roof for 2 days in a row. I have also seen a few of them touch the wire and even though it did not kill them it knocked them unconscious and took at least half of their nine lives. Shortly after finding today’s last fatality the lady that put the wire up showed up. I tried to be nice but explained to her that I was afraid of what might happen if one of the kids ever touched the wire. At first she insisted that there was no electricity running through the wire. I then told her that at least once a week I am woken up by a shrill scream followed by the thud of an unconscious or a dead cat landing on my roof. She once again told me that she was sure that there was no electricity running through the razor wire. I then offered to take her to the top of my house where she could look over the back wall and see the bodies of this weeks collection of dead cats. I think that she was afraid that once she got up there I would have her touch the wire to prove to me that there was no electricity running through it. I must admit the thought had crossed my mind. Any way she refused my offer to com up on my roof telling me that perhaps some one that worked for her had run power to the wire with out telling her. “Good, problem solved.” I said. “What do you mean she asked. “Well since you didn’t think that there was electricity in the wire but now realize that there is all you have to do is disconnect it.” I said. “I can’t do that,” she said, “some one might break into my place and steel my computer.” “I hope that your computer is worth some ones life.” I said as I walked away. For the time being no more kids are allowed up on my roof. 4 PM rolled around all to soon for Byron and Moises. For some strange reason these 2 boys seem to like flying kites better than spending the afternoon in bed. Abner, Calin, and Lady came along to bring the kids back to the orphanage. They have become best friends with the orphanage kids and seldom miss an opportunity to be with them. Well it has now been nearly a half hour with out having the doorbell ring. If it gets any quieter around here I may have to go open up the gate and let a few kids in. It was a bit of a weird morning this morning. The breakfast crew was about the normal size but the church crew dwindled down to 2 of us. Windy was having her 15th birthday party today so her family stayed behind to use my shower. Abner and Fernando kept stalling on getting permission from their aun, to go to church t so they got left behind. Calin was going to come along but Jason beat him to the front seat of the car so he told me that he would not go unless I made Jason move. Calin was a bit shocked when I smiled and said good bye. When I was gone he told the other kids that he is never coming back to my house. Never, ended up being a few hours. To the Sunday school teacher’s dismay Jason ended up being the only one to come along to church. He can often be more of a distraction than all of the others put together. After Church I went to Wendy’s birthday party. I had mentioned that a girl’s 15th birthday party is often times as big of an affair as a wedding but today I was proven wrong. It was a bigger affair than most weddings that I have been to. I stayed for 4 hours but understand that the festivities are still going on. It was a neat birthday party though and other than the preacher taking full advantage of a captive audience by delivering a 2 hour sermon that consisted of a lot of hollering and screaming they had a good presentation. There was a neat Spanish stile Christian band and several different singers. Most were good, one sang in much the same manner as the preacher preached, mostly screaming. Just as I was finishing the last paragraph about 25 people came to my gate. The birthday party has just ended at Wendy’s house so some of the kids that hang around my house brought about 20 cousins and friends who had come to the party from Guatemala City over to my house to play basketball and use my computers. They had thought about walking in to Chemaltenango but were afraid to since one of them was the brother of the boy that got murdered here in town a few months ago. Most of them were teens and even though they were in a large group they were quite shy at first but quickly made themselves feel right at home. I decided that with that many people in the house and yard I just as well do my writing later. Before leaving they all thanked me for having them over and asked again if they could stop by more often. I told them no problem but I do hope that it will be after we have eaten supper. Calin who only this morning vowed to never return to my house is fast asleep on the floor. Abner has fallen asleep on my bed. Fortunately he is lighter than Calin and I can usually move him without waking him up. I have considered buying another bed but really don’t have all that much room in my house. I had been told over the phone that some of the kids at Hermano Pedro were going to use the pool today so I had no difficulty getting Calin and Abner to come along. Thankfully they only put some of the more active kids into the pool because the water was really cold. Calin and Abner toughed it out, I did not. After they had finished playing polar bear both boys helped me repair some wheelchairs. We didn’t take any kids to lunch because I had been scheduled to meat with a group of people at 11 AM and shortly before 11 they called me to say that it would be more like 1 PM before they could get there. I was glad that I waited for them though because they were very interested in the various facets of the ministry and we had a good visit. After they left the boys and I headed for lunch and then for home. I plan on leaving for El Salvador at 5 AM so the kids have already been ushered out of the house for the night. A few of them acted like it will be 3 years instead of 3 days until I return. Calin has already been back to show me the kite that his step dad made for him and to say good bye again. Calin’s family has just moved back in with Calin’s step dad for the third time in the past 2 months. So far he is being nice to Calin and Calin’s mother but I am holding my breath. Please pray for Calin’s family. If Calin, his mom, his brother, and his sister do not live with Calin’s step dad they have to stay in 2 small rooms of grandmothers house which is already bursting at the seems with another aunt and her kids. We are still waiting on an OK from Hermano Pedro to enroll Sonia into a private school so please keep praying. Please also pray for our safety as we will be doing a lot of driving during the next few days. Pray also for camp which is just around the corner. Our teen camp will start on November 12, then children’s camp on November 19, and adult camp on November 26. Since I had been on the road for the past several days I had a lot of catching up to do when I got back home. Most of my day was spent at home getting caught up on my journal and a bit of house work. I managed to take a few hours off this afternoon to go out and fly some kites with the kids and also opened up the house to them for a good part of the day. We had a hamburger fry this evening and at last count there were 16 of us. I am sure that there were more but some of them didn’t sit still long enough for me to count them. I went in to Hermano Pedro this morning. It was great to see the kids again. Since there were no volunteers to come along with me to lunch I was only able to take Byron and Moises along to lunch. David, Bobby, and several of the others gave me sad looks as we left to lunch but there was no way that I could take more than 2 kids single handedly. When we got back to the orphanage I got right to work on a few chairs that had been broken while I was gone. I would have much preferred just hanging out and playing with the kids but Some of the kids had not been out of bed for a week because they had broken wheelchairs. As you may have noticed my journal entries have been shorter the past few days. That is because school is out for the year and I have decided to give more of my time with the kids for a few evenings. Don’t worry I plan on doing some of those lengthy ones again soon but for right now I feel that the kids need a bit more of my time since I have been on the road so much lately. Fernando just came in to remind me that I would play some basketball with them so I better run. Fernando, Calin, and I headed to the Escuintla area today. On our way through Antigua we picked up Paul. 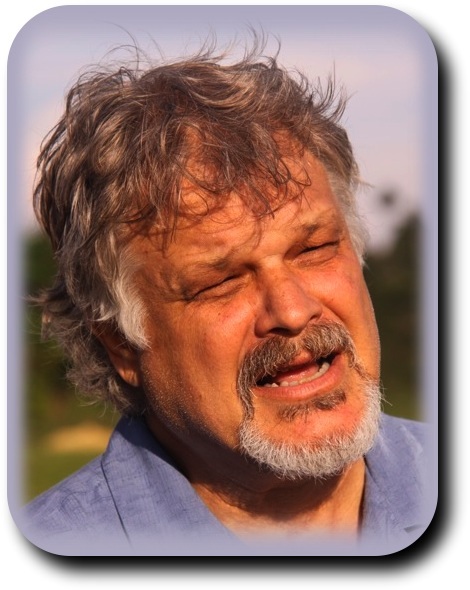 This is not Paul Tjaden who has been helping us out with building the grandmother’s bathroom but another Paul. He and his wife came into Guatemala around 2 weeks ago to sort of scout things out. When I asked him yesterday if he would like to come along today to see some of the people who live in the more remote areas he jumped at the opportunity. Our first stop was at Sergio’s home. Sergio is the boy who lives in Santa Lucia that wants badly to go to school. I still have not had the opportunity to set up a power chair for him that will be capable of navigating the hills and bumpy dirt roads that lead from his home but plan on doing that soon. Meanwhile Sergio’s mother has been searching for a school that will accept him. Since he is in a wheelchair the public school that is near his home will not take him. We thought that we might be able to get him into a small Christian school that is in his town but unfortunately they are filled to capacity and have a long waiting list of children that want to enroll. Sergio’s mother finally located a school that will accept him. Today Sergio’s mom, Paul, the 2 boys, and myself walked the rout that Sergio would have to go with his power chair. The school is located nearly a mile from his home but once he gets about a quarter mile from his home the streets are paved and fairly level. When we arrived at the school we met with the administrator and his wife. They seem like they are very dedicated people who are not operating the school simply to make money but have a genuine concern for each and every student. They told us that several of their students are not able to pay anything for attending this private school and that if we were willing to pay for Sergio’s books, Uniforms, and needed medical supplies they would not charge him any tuition. This would be a real blessing because he will have some needs that will already cost us as much as our other students average per month. I took some measurements and photos of a set of 3 steps that Sergio will have to go down in order to get into the school and promised that we would build them a portable ramp that he can use once he gets his power wheelchair. Classes don’t start back up until the middle of January so we have 3 months to get things all set up for him. Our next stop was about an hour towards the coast. Ronny has been calling me every few days for the past week and a half. His power chair had stopped running and the tires on his manual wheelchair had gone flat. Almost every small village has at least one shop that fixes bicycle tiers but as hard as it is to believe I have yet to meat one that will fix a flat tire on a wheelchair. Unlike the USA it is not because they are afraid of a law suit or anything like that it is simply the way that things work here, Even though a wheelchair tire is no different to work on than a bicycle tire a bicycle tire repair man won’t touch it simply because of the fact that it is not a bicycle. The same thing goes for an auto mechanic here in Guatemala. They would never consider replacing even something as simple as a missing or broken bolt on a bicycle, tricycle, wheelchair or any thing other than a car. Unfortunately this often leaves some of our people who are in wheelchairs with out transportation for the simplest of reason until they can either get their wheelchair to us or we can get to them. Today Ronny’s manual chair was a classic case. I was a bit suspicious when I was told that both tires mysteriously went flat while he was at school. Sure enough there was nothing wrong with either tire other than the fact that some one had simply let the air out of them. I asked Ronny’s father if he had tried to pump them up before calling us. He told us that he had not because he only had a bicycle pump. Had I taken a felt pin along I would have written bicycle and wheelchair pump on it for him because I am not sure that he is still convinced that it will work on both. 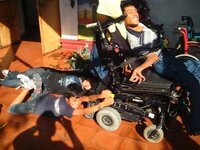 Our drive out was not in vane though because he was having problems with his power wheelchair and after seeing how some of the auto electricians in Guatemala fix things I just as soon that they keep believing that since it is not a car they can’t fix it. I did manage to get it going and Ronny was once again off exploring with his power chair. While we were there we talked more about the new house that is going to be built for the family in February. I don’t think that it will be any to soon either. Ronny’ parents told me that just a few days earlier they had to put Ronny’s wheelchair up on a table because the water in their house was knee deep. Paul enjoyed himself but commented that he had never realized how poor some of these people were. It is one ting to hear about people who are going hungry every day but quite another thing to sit and visit with them. Before leaving Ronny’s mom took us to a family that lives in another dirt floor house. The lady there had been hit by a buss a few weeks ago and has no wheelchair. She seem to be in a lot of pain. She told me that she saw a doctor. It looked to me like she had a broken femur but the doctor that she saw had not even put it in a cast. Before leaving we gave Ronny’s family some groceries that we had bought. I had not intended on bringing them any on this trip but Fernando had convinced me to do otherwise. Before we left this morning he asked me if he could take all of his hard earned money out of my book and by some food for Ronny and his family. Granted his earnings were less than a dollar but it got me thinking about a widow who did the same thing nearly 2000 years ago. I told Fernando that we would stop and buy groceries and that he didn’t have to use his money. As we sat eating supper in a restaurant a few hours later I could not help but wonder if we should have been willing to give even a little more to this family. On our way back my car started running really rough but we managed to make it home. I plan on taking it to a mechanic on Monday and from the way the engine sounds I am thankful that camp recruiting is finished for the year. Tomorrow morning I am suppose to take 12 people to a birthday party that is about an hour and a half from here. Fortunately Chris can spare the Kia van for the day. Wow it looks like those sort journals didn’t last all that long after all! I was not especially looking forward to today. Earlier in the week I had promised Calin that I would take him and his relatives to an aunts birthday. That was before I realized that 12 people wanted to go. It was also before I realized that my car would not be running, and not until I was an hour into the trip did I realize that Calin’s ant lived not a half hour from Chemaltenango but an hour and a half away. There seemed to be so many things that needed catching up on at home and I really needed to get my car into the shop. Never the less a promise was a promise and unfortunately Chris did not need the van today so I had no good excuse not to go. At 8:00 AM I picked up Calin, his grandmother, his mother, and 9 others and headed out to a birthday party of some one whom I had never met. I must admit I cheered up a bit when I discovered that Calin’s uncle and aunt did not live in the town of San Martin as I had been lead to believe but way out in the middle of no where. Granted it was a long bumpy drive but the hillside that they lived on was beautiful. Uncle and aunt owned a lot of land that had everything from corn to coffee planted on it. They also had some fruit trees an pasture land with cows grazing on it. The home that they lived in was simple but spacious and the had flowers growing everywhere. They welcomed me like I was a long lost cousin and I soon felt right at home. Even though Calin had to translate for me we had a great time visiting. While some of the ladies prepared lunch over a wood stove that filled the kitchen with smoke some of us took a walk to a nearby stream. Some of the kids went swimming in their Fruit Of The Loom swim wear. Still having a bit of USA modesty I chose to stay out of the water. When we returned to the house a large lunch was served. I sat across from the village pastor and his wife and we had a wonderful visit. When it was time to go home I hated to leave. I had almost forgotten what country life was like. Any way what I thought was going to be a wasted day turned out to be a fun and relaxing day and I was sorry that I had tried to get out of it. Three of the kids have once again built a tent city in my living room and are now working hard on convincing that it would be a shame to have gone through all that work with out being able to sleep in it at least one night. I was looking forward to a quiet night at home but I am sure that I will give in just like I did with taking Calin and his relatives to the birthday party. As I look at these 3 I realize how much it means to them to be able to have some where that they can feel safe. One of them has come from and abusive home, another has not seen his mother since he was a year old, and the other one is still wondering if they will find the murder of his brother who was shot in cold blood here in Chemaltenango a few months ago. Happy Thanksgiving! No the Guatemalans do not celebrate Thanksgiving in October. As far as I know they have no Thanksgiving but that does not stop the Moony family from celebrating one of the most traditional American thanksgivings that you could possibly imagine, complete with Turkey, Stuffing, Cranberries, every kind of pie that you can imagine and dozens of other great things to eat. Since things get a little busy around camp time Chris and Donna celebrate Thanksgiving about a month early and they do it up good. After dinner we all sat around the table and shared what we were thankful for. It was a fun way to reflect on how good God had been to each of us this past year. I took my camera along but with all of the good food and great fellowship I forgot to take any pictures. It’s probably for the best any way because the pictures would just make everyone hungry. Thank you Chris, Donna, and family for making me a part of your family! Since my car is not running well at all a few of the kids and my self had intended on walking about a mile to where we could catch a buss to Antigua so that we could go to church, however a heavy rain made us change our plans. Gordon graciously let us borrow his car though, so 4 of us still went. I had planed on going to the orphanage after church but since we had Gordon’s car we decided that we had better get back to Chemaltenango. The rest of my afternoon was spent at home. I even managed to have the house to myself for about 2 hours but after that it was wall to wall kids. Abner and Alex offered to make supper tonight so I let them have at it. I think that we had pancakes but I am not quite sure. Alex’s mom came over shortly after the boys started cooking and told me that he and Elder, who was also here, were suppose to be in church but had snuck over to my house instead. I knew that he usually went to church with his mom on Sunday night and had asked him when he showed up here why he wasn’t in church. He told me that it had gotten out early. I have rules here about lying and Alex’s mom has rules about skipping church. It will be 6 days before Elder returns to my house and 8 days before Alex is allowed to come back. It will be a bit hard on both boys but I am thankful that they have a mother who cares. I wish that all of my kids had parents that cared. Anyway Abner who seldom likes to help out with any of the work was now on his own. At first he got quite frustrated and wanted to quit cooking but after showing him that it was best to wait to flip the pancakes until they were no longer a liquid he began to get the hang of it. After a while you could even recognize a few of them as being pancakes. The kids were all hungry enough though that none of them complained. Or perhaps they didn’t dare complain because they knew who would be doing a week worth of cooking if they did. Everyone helped clean up and I took a turn at doing the dishes. No one is spending the night because I am going to get up at 5 AM and take my car into a shop in Guatemala City. Because of the way that my car is running I want to get into the city before the traffic gets heavy. Well I better head off to bed. This morning Chris and I brought my car in to Guatemala City to get the engine rebuilt. I was glad that we left early because the engine was not doing well at all. I decided to pay the big bucks and get everything done right because I hope that I can use this car for many years. Tomorrow they will let me know exactly what the cost will be. After Chris And I got back to Chemaltenango I took the Kea van to Antigua. Several of the kids wanted to accompany me but I had to get a lot of work done there and felt that I had better go by my self. Even though I still had a lot of little helpers once I got to the orphanage I actually managed to get a lot of wheelchairs fixed. I didn’t take any of the kids out to lunch today but did take a few the ones that helped me out for a coke before returning home. Not as many kids as usual showed up for supper tonight but those that did ate enough that you would have thought that there had been 15 of them. I am heading off to bed early because we have a large wheelchair distribution planned for tomorrow. 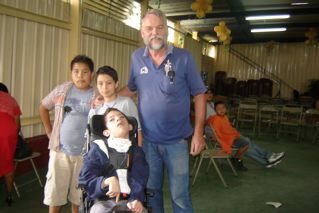 Calin and Abner begged me to let them come along to the wheelchair distribution today. This morning I agreed to take both boys but let them know that this we were going to be busy seating people in wheelchairs and if they did not intend to work they would be far better of staying at home. My little lecture was mostly for Abner’s benefit. Calin has come along before and has done a great job of helping out. Abner can be a different story though. Some times he can get so stubborn and moody that I hardly know what to do with him. When we got started Calin teamed up with me and Abner with Benjamin and both boys did great. Before doing any seating of wheelchairs we had a short program for the people that had come from as far as 5 hours away. The Guatemalan teens that will be helping out at camp gave a Christian drama then Chris followed up by sharing about the love of Christ. 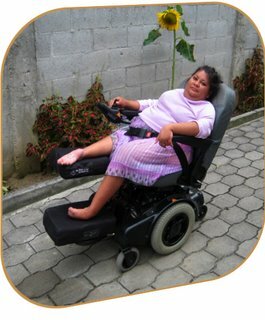 Following that all of us worked at demonstrating Christ’s love by personally fitting 49 people into their own personally fitted wheelchairs. Some of the people were out of the door with in minutes and others took several hours to fit. We tried to make the time that we spent with each of them a special time. Letting them know not only that we cared but that God cares. Calin lit up when he recognized a man that works at a gas station that is a few miles from my house. One day while stopping for fuel at the station where he works Calin struck up a conversation with him. 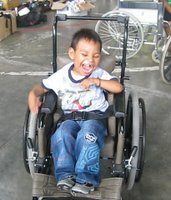 Some how Calin HAPPENED to mention to him that we give away wheelchairs. I could tell that the man wanted to know more but I did not know why. Never the less I did not hurry their discussion and after a while Calin asked me if I had a wheelchair forum with me. Just by CHANCE this man had a son of 12 years old who could not walk but had never owned a wheelchair. LUCKY thing that we had HAPPENED to pick this particular gas station to stop at, especially considering that there are many gas stations nearer to my home. LUCKIER yet was the fact that this man HAPPENED to come to my car considering there were around a half dozen attendants standing there. Today when Calin and I walked over to this man, he quickly introduced us to his wife and son. According to what Calin was interpreting this family didn’t think that they had been at all Lucky. They were giving all of the credit to God. It almost made us think that we had experienced another one of those GODINCIDENCE things. The first little boy that we fit today had been brought in by his mother for a wheelchair. I knew that she was extremely appreciative and being able to see her son in a wheelchair brought tears of joy to her eyes. I took my time getting him set just right but knew that out of the 49 chairs that we were giving out today over half were specialty fits. I had been watching this mother though and see was so great with this little boy that I could not help but wonder if we could do more. A good part of the time that she was holding her child she would gently lower him to the floor. Even though his legs were to week to hold his full weight he seemed to enjoy moving his feet in an attempt to walk. If only we had a walker that would give him enough support and if only I had the time. I looked around and realized that we had 5 teams that were doing specialty fitting. Back a few years ago we were fortunate when we had more than 2. I then looked back over at this loving mother and her child. Even if we were swamped didn’t they deserve the best that we could give them. WWJD. I soon found my self at our shop next door to the church that we had been working in. The walker that I needed for this little boy would have to have more support than any walker that I had ever seen but perhaps there was something that would work. We had one that would perhaps work wit a lot of modifying but Chris told me that it had already been promised to a child that we will be seeing at another distribution. Suddenly I saw something that I thought might work. It was a walker that had recently come in on a container. Although it had not yet been refurbished it appeared to be in good shape. One part was missing but I figured that we could come up with something to replace that part. About 2 hours later the little boy was standing straight and tall and making the first small steps that he had ever made with out being held up by some one else. I was glad that we had gone that extra mile. I can only share what I personally witnessed today but I know that everyone that helped out today could share similar stories. Just seeing the look on Abner’s face after he had worked with out complaining until the last chair went out of the door, told me that he had truly experienced what it was like to be able to kneel at someone else’s feet and share the love of Jesus. Calin and Abner accompanied me to Hermano Pedro this morning. When we got there a group of 7 Americans was already waiting for us. I had promised them that I would show them around the orphanage and get them involved is helping out with the kids. Actually I didn’t have to do much because this was one of the most enthusiastic groups that I have taken through the orphanage in a long time. The fact is we stopped the tour at about the half way point when we discovered that the kids were in the pool this morning. With in a few minutes eight of us had joined the therapists who were already in the pool with some of the kids. Soon 8 more kids were added and we spent the next hour having a fun time with them. After getting out of the pool and finishing our tour we took 8 of the residence to lunch. Today I was finally able to keep my promise to the teen age girls who had been eagerly waiting to go along to lunch for quite some time now. Today’s group was great with the girls and everyone had a lot of fun. This afternoon the group spent more time with several of the kids while I repaired a few wheelchairs and had a meeting with social work concerning the kids, teens, and adults that we want to invite to camp this year. We are praying that they give the green light to all of those that we want to invite and should have their answer within a few days. 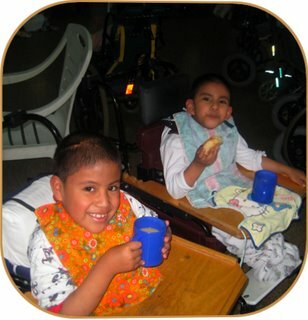 After the group help feed the orphanage kids their supper I took them back to where they are staying in Guatemala City. Since it was almost 7PM Calin, Abner, and I stopped off for a bite to eat before heading home. I think some of the neighborhood kids gave up on waiting for us because I only had another 5 to feed after getting home. As far as I can tell all of the kids have now gone home but I never can be quite sure. Sunday morning I woke up and found Abner sitting in my living room. First he told me that he had fallen asleep under a blanket on a chair by the computer but later he told me that he had showed up at my place a little before I woke up. I am still not sure what the truth is. Either way kids or no kids I am heading off for bed. Today for the second day in a row I watched a team of 8 dedicated individuals help transform at least a few days of boredom into a memorable experience for a number of children. If everyone that came to Hermano Pedro or any other place where they wanted to serve, with as much unselfish Christina love that this group did the world would soon be a much better place. I have found that children, especially handicapped children are a pretty good judge of people. The children at Hermano Pedro Gave each member of this team top scores. Seldom have I seen the kids have as much fun as they had at Camperos and even getting thrown up on, or peed on did not seem to discourage any of today’s volunteers. I was glad though that Guadalupe one of the men at the orphanage had an extra shirt for me to change into after Andrais decided to share his half digested lunch with me. Rule # 177 – Never hold a kid over your head if he has just eaten. Not only did we take 9 of the orphanage kids to lunch today but we also found the time to visit the School in Santa Maria Dejesus, Stop in at the YWAM coffee house, visit the wheelchairs shop, and have a pizza feed at my house. I lost count of the people that showed up but all 10 large pizzas seemed to vanish into thin air. My friends from the USA had a great time with my neighborhood kids as well. Poor Kimberly, she offered to sweep and mop my house after everyone else went home. I don’t think that we fed 4000 but it looked like she gathered up about 12 baskets of pizza crumbs from my floor. Since I am planning on heading out on the road again on Thursday I may take at least part of the day off tomorrow but have not fully decided yet. At any rate I am going to kick back for a while now so I will once again say goodnight. Last night shortly before going to bed I got a phone call from Paul. He had originally planned to start tomorrow on taking a small team of people in to build the bathroom for the family that he and I had visited last week, but had changed his mind. He had heard from a few different people that this may not be a safe place to go and didn’t want to go in with a team unless he knew that it would be safe for them. Chris and Donna were out of town recruiting for camp so I got hold of Gordon (Donna’s dad) so he and I decided to go in and check things out. We both know people that live in that area and knew that they would truthfully tell us if this was a safe place for Americans to go into. Jorge, a friend who hauls wheelchairs to distributions, in his truck, also accompanied us. Just a few weeks ago Jorge’s helper had been killed when he was struck by a truck while crossing the street. Jorge and Chris had gone to visit his 24 year old widow and their 4 children and what they found broke their harts. She and her 4 children are living in a one room dirt brick structure that only has room for one bed that the entire family sleeps on. They had no food and lived in absolute poverty. Now with her husband gone they would be even worse off if that is possible. Today Jorge, Gordon, and I went in to see if there was enough room on there tiny section of land to set up a steal prefab house. When we first arrived the family seemed like they were frightened of us and were extremely shy. Usually I never take out my camera with out asking first because many people are even more frightened of it then they are of seeing white people. Today however I decided to take that chance because we really needed pictures if we were going to try and find any help for this family. To my surprise my camera was the big ice breaker in making friends with this family and several others that had gathered around. All it took was showing 2 of the children a digital picture that I took of them and almost everyone’s shyness rapidly disappeared. Soon all of the children wanted me to take pictures of them and before long most of the adults even got over their shyness and let me take their picture. Several kids took me inside of the home where the mother and her 4 children lived and it was even smaller than I had imagined. There is a lot more that I can tell you about this family and some of the hardships that they have seen both recently and during the war but Chris has written a more detailed story about them so I am posting it here. Please remember though to pray for this family. 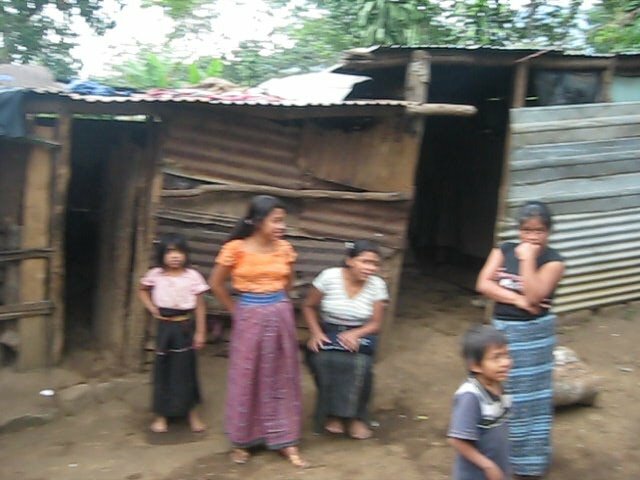 Here in Guatemala people don’t go on welfare, unless someone helps they starve. From time to time, we’re faced with situations that are not always pleasant. We are reminded that life can give us some strong blows. The story I’d like to tell you about has to do with a man that passed away a month ago. His name was Rigoberto. I had gotten up early in the morning to take some friends to the airport. While we were still loading up their luggage at 3:00 in the morning I received a phone call from Jorge, a member of our church, saying that his helper had just been run over in a hit and run accident on the highway here in Chimaltenango and that he had died. We quickly went out onto the highway to be with Jorge, and comfort him. Rigoberto has left a wife and 4 young children behind. I was so saddened to hear the story of this man’s young life. It seemed that it had been filled with one hardship after another. During the civil war in Guatemala his parents were killed when he was just 6 months old. He and his younger sister went up into the mountains to live with their grandmother. Another sister stayed behind to live with others. When he was 8, he and his sister came out of the mountains with their clothes tied in a bundle on their backs to tell the older sister that their grandmother had passed away and they had no place to go. 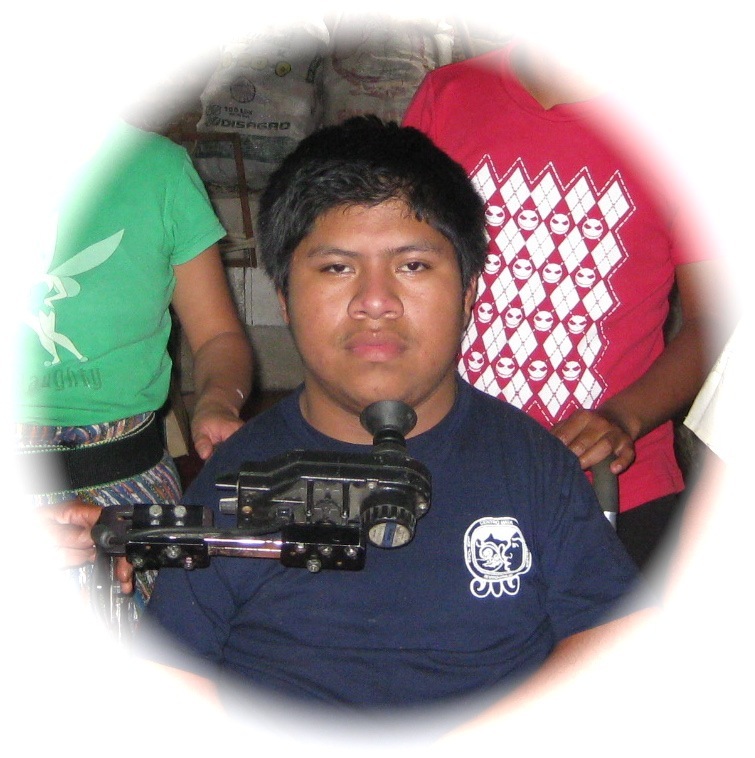 So at the age of 8, Rigoberto began working to support himself and his sister. When he was older he found the love of his life, Maria. They married and had 4 precious children. They served the Lord together. Soon after the accident, Jorge and I went to visit the widow to take her some food and see how they are doing. When we got there with the food, Maria began to cry. She is a very timid woman, but is trusting the Lord for the care of her children. As I walked into their little 8x10 house, I saw that there was hardly anything in it but one bed that they all sleep in. They were very poor before her husband died, and now they are devastated. Rigoberto worked very hard, but with little education and no hope for a good job, they were barely getting by. The metal roof of the house is filled with holes and when it rains it just pours in onto the dirt floor. The little plot of land where they live is theirs, and we hope to be able to erect one of these new prefabricated homes for them. Wouldn't it be wonderful for each of them to have a bed! This is a family that would be great to help. The bible says if we help the widow, that is what pure religion is all about. This family is just one of many that need help with a home. The prefabricated homes have already been donated by Gulf Coast Supply and Mfg. Inc. and 6 are in a ship on their way here now! What we need help with is funds to be donated to pour concrete slabs. Please, pray about it. Thank you so much for your continuous prayer and support. We need it! After saying good bye we headed to where we want to build the bathroom for Maria’s Grandmother and her family. When we arrived at their aldea we stopped of at the home of Celco. Celso is a man that has come to many of our camps. Since we know him well and he has lived here all of his life we knew that he could tell us how safe things were in this area. Celso told us that there had been several murders back in January but they were all gang related and nothing had happened in several months. He said that the villagers were still a bit fearful at night but life was pretty much back to normal. He saw no problem with coming in to work as long as we always left before dark. We always try to make that a practice here in Guatemala anyway. I gave Paul a phone call and he agreed to come in on Monday and start the project. Before leaving we stopped off at where Grandma lives and were delighted to see that several of her grandchildren had cleared off the spot where the bathroom was going to be built. They had also dug a large hole for the sewage. Having there own bathroom seems to mean a lot to them. After returning to Chemaltenango and dropping off Jorge and Gordon I decided to treat my self to dinner. No not hot dogs with the kids but a good dinner in one of my favorate restaurants in Chemaltenango. It is not often that I splurge and spend $9 on dinner here in Guatemala but tonight I did. I still made hot dogs for the kids when I got home but did so on a full stomach. It was a good thing that I had already eaten or the 24 hotdogs that I had made would not have been enough. I let the kids stay later than usual this evening because tomorrow I am planning on heading to Rabinal. Carlos is planning on coming along with me and for a change I am not taking any of the kids. They don’t seem to mind to much though because I told them that we were going to be doing a lot of walking on this trip. I also promised that as soon as report cards came out I was going to take everyone who did not receive a red mark to the water slides. All of the kid except Calin have now gone home. He is fast asleep on the floor. I think that I will quickly claim the bed before he wakes up and decides to take it. After a 5 hour drive down dirt roads we are finally in Rabinal. I had warned Carlos that we would not be staying in a 5 star hotel but by the look on his face when we got here I don’t think that he was expecting a -5. I must be getting use to the $8 per night hotels because it doesn’t look all that bad to me. Granted the light from my neighbor’s room that shines over the wall that does not quite reach the ceiling and the fact that I can hear every word that they are saying may get a bit annoying by around midnight., but the people that run this place seem friendly. When I mentioned to them that I did not have running water they quickly offered me another room. It didn’t have running water either but I guess that it is the thought that counts. They told me though to be patient because lately the water has been coming back on at around 9:30. Mean while you are going to have to put up with even more spelling mistakes than usual. Myy fingersss aree dirrty and they keeep sticking toooo the keys… Anyway I have been in motels that have been far worse. I don’t think that Carlos has, but then there is always tomorrow night. I just love taking people along on these trips. It is great to see them broaden their horizons. We met with Julia and her husband this evening. We had originally intended on doing camp recruitment tomorrow and then hiking in to where Andrais lives on Saturday but Julia’s husband has a meeting on Saturday so we have decided to try to make it in to Andrais/s house tomorrow. We may take in some worm medicine but this first trip in is going to primarily be to assess what the needs are. From what I am hearing they are overwhelming. Well we are planning on getting an early start in the morning so I am going to see if I can reach over the wall and turn down my neighbors TV and get some sleep. After breakfast Carlos and I picked up Julia and her husband Luis. They are the ones that originally hiked in to where Antonio lives and brought him out to us a little over a year ago. Antonio, who weighed 21 pounds and was 10 years old at that time, was starving to death. After several months in the malnutrition ward of Hermano Pedro his father was able to take Antonio back home. In the time he was at Hermano Pedro Antonio gained a lot of weight but he still had some health issues. Today Julia and Luis were going to hike us in to where he lived so that we could see first hand how he and his family were doing. We also wanted to see if there was anything else that we could do to help the 1200 people that are scattered throughout the mountains in this area. After about an hour’s into the mountains my 4 wheel drive would go no more. Even a Land Cruiser has it’s limits and even though I have crossed many rivers with it the Volkswagen size boulders in this particular river and the 1000 foot clime up a foot wide trail on the other side of the river was more than it could handle. After parking my car we were met by the 2 men who would guide us into where Antonio lived. I immediately recognized one of the men as the head man from this area. He had brought Antonio out to Rabinal the day that Chris and I had brought him to the hospital. Even though Antonio only weighed 21 pounds I could not help but wonder how any one could carry him down this mountain side. The 3 hour hike, or perhaps I should say climb proved to be just about all we could handle. Some of the places were so steep and muddy that it seemed you would slide back 2 feet for every one that you attempted to climb. Even though it was raining the view on the 3 hour hike going in was breathtaking. My GPS later confirmed the fact that it was indeed mountainous. We not only gained 1000 feet in elivation along the way but did so several times. As soon as we would crest one mountain we would have to descend into a valley and then ascend another. None of the people in this area live close together. Their houses are scattered throughout the mountains. We met very few people along the way. Our guide told us that as far as he know I was the first white person that they had ever met but I think that it was Carlos’s new orange hat that frightened them. I had warned Carlos, who generally wears sandals, that we would be doing some hiking but the smooth soled cowboy boots that he wore were not much better. The guides that we were with were very courteous though and didn’t seem to mind pulling him out of the brush when he fell off from the trail. Carlos has a lot of eremitism and the climb was almost more than he could take but he was very good about it and said that he would not have missed it for the world. Finally our guide pointed at a cement building that was bout a half mile up the hill. He told us that it was a school and that Antonio’s family lived only 15 minutes beyond it. I think that theirs was the closest home to the school. It was hard to believe that there was a school way up here. Harder yet to believe was the fact that the people had carried in each and every cement block that the school was built from. Harder yet to imagine was that there were 1200 people living in the region. We had not spotted more than a half dozen houses on our 3 hour hike in. The only other building that we saw that was not made out of mud brick was a cement building that measured about 15 by 15 feet. We were told that it was the a new clinic. Up until about a year and a half ago these people had no medical help whatsoever. The 2 men who guided us in were instrumental in convincing the people to build this small building and then convincing the Guatemalan government to send in 2 nurses once a month. They told us that the nurses usually brought in very little in the way of medicine but at least it was a start. A short time later we reached the home of Andrais. I have seen severe poverty over the years but this had to be one of the most severe cases that I had ever seen. Andrais, his mother, and six other children were huddled in a small dirt house that most American farmers would be ashamed to keep their pigs in. Even though it was raining and we were at 4500 feet some of the children were naked and most of the others had no shirts or shoes. Andrais was the only one that was fully clothed. Mother explained that he had a fever and she had put most of the clothing that the family owned on him to keep him warm. He was not back down to weighing 21 pounds like he did when we brought him in to the hospital but at least half of the weight that he had gained while he was in malnutrition was gone. Carlos quickly handed out some groceries that we had brought the family but we knew that with in a few days everything would once again be gone. Andrais’ mother told us that he had done fairly well when they first took him home from malnutrition but after running out of the medicine that the hospital gave him for his asthma he had started going down hill again. She said that the father was working in a village several hours away but should be back in about a week. She promised us that she would talk to him about getting Andrias back into Hermano Pedro again. We did not go into detail about weather they would want him to stay there on a long term bases or only until he regains his strength. Some of these decisions are very difficult for these parents. Moat of them dearly love their children but they are to poor to care for them properly. I know that it is easy to get judgmental and point fingers at the parents of these extremely large families but the fact remains these children are real and they need help. I plan on at least getting the ball rolling so that if Andrias’ family decides to brings him back to the hospital, the hospital will be ready to admit him. Unlike a few other families that we have worked with this family waited until Andrais was in fairly good health and the hospital actually went along with their decision to take him home. Tomorrow I plan on stopping off at the home of Jose. Against the doctors wishes his parents removed him from the hospital while he was still verry sick. If they ever decide that they want him back into the hospital I have a fear that the hospital will not accept him back. Please pray for these families. They don’t always make what we think are the right choices but then again we have not walked in their moccasins. We stayed about an hour at Andrais’ house but then it started to rain hard again and we knew that if we waited to long it would be impossible to walk down the steep mountain trails. With the help of our 2 guides Carlos had made it but the rain was doing nothing for his already sore knees and legs. The 2 men that had led us up the trail tried to find a horse or burro to bring Carlos at least part of the way down the mountain but they told us that the only horse that could be found was in worse shape than Carlos. It was decided that we would take a different trail back. Although this one was much longer it was not as steep and would be easier to walk. This one still had some steep places but unlike the one that we came in on it did not feel like you would fall 1000 feet if you happened to loose your footing. Fortunately the heavy rain let up after about 15 minutes and even though we were soaked no one got chilled. I was grateful though for a wool sweater that I had almost left back at the car. Even though this trail was longer we made it back to the car in less time then it took s to get to Andrais’ house. After driving back to Rabinal and dropping of Julia and Luis Carlos and I found a different motel and got into dry clothing. This motel was not much of an improvement but it did have running water and warm showers. The door to my room was warped and although I could open it from the outside by kicking it I had to yell at Carlos who was in the room next door to come and kick it open for me when ever I wanted to get out of it. I kept hoping that if there were a fire during the night I would be able to figure out some way to get the door open. I could not help but thinking how good I had it though. At least I had a room with a door and dry clothing to put on, and if I could get the door open I would also soon be eating a warm meal. After we got cleaned up we drove back to where Julia and Luis live. We had invited them and their 2 children to join us for supper. We had also invited someone else. Ludwig a 8 year old boy who lived in a neighboring town HAPPENED to call me on my cell phone yesterday. He used to be in the malnutrition ward at Hermano Pedro and after he returned home we helped get him into school. I had visited him about a month ago when Ashley Vander hook and a friend were here. At that time I had promise that I would comeback during camp recruitment and take him and his family to a Camperos in a town about a half hour from his. He had loved coming along to Camperos back when he was at Hermano Pedro. I had forgotten all about my promise until I pulled into Rabinal yesterday. How Ludwig had picked that time and hour to call me I don’t know but since I HAPPENED to be in the neighboring town and HAPPENED to have his invitation for camp with me I decided that it would work out great to take him out to eat. The fact that Ludwig was already repeating the word Camperos over the phone when I put it to my ear also helped in giving me the idea of inviting him, and since he had just had his birthday a few days ago why not call it a birthday party. Soon Ludwig, his mother, and sister had joined the 6 of us and we were on our way to Camperos. Since there were 9 of us in my car I had to leave Ludwig’s wheelchair behind but he did not seem to mind being carried. After a great supper with great friends we are finaly back at our motel. I managed to get my door kicked shut and hopefully Carlos is not to stiff and sore in the morning to kick it open for me. At least no one is going to get into my room tonight with out me hearing them. We got going a bit later then usual this morning. Carlos was quite sore but able to move and even able to get my door open for me. After having breakfast at Julia and Louis’s home Julia joined Carlos and me and we went out and did more camp recruiting. Luis did not join us today because it was his father’s birthday. Before leaving to his father’s house Luis showed us pictures of several children who he hopes we can help with getting into Hermano Pedro or other hospitals for much needed surgery. The needs ranged from Cleft pellet to severely deformed leg’s. All Carlos and I could do was promis that we would talk to the people at Hermano Pedro and get the word out to a few other organizations that we know of. Carlos went along into the homes that we could drive to but decided to leave today’s walking to Julia and myself. Most of the places that we did have to walk in to were not all that far. One took us a little over an hour round trip but compared to yesterdays mountain climbing experience it was a walk in the park. Most of the people in the area that we visited today are very shy and many of them didn’t even return a friendly hello. This was not the case with the families that we knew though. Now that we haves visited most of these people several times they all expect you to stay for hours. We stayed and visited most of the homes for quite a while but would then have to explain that there were other families that we wanted to see today and move on. One visit that almost didn’t take place was a visit to the family of Jose. I know that we were going to pass right by his place but this family was not on our list of campers so why stop. Besides that what was there to say to a family that took their son from the hospital against doctors orders knowing that he could die. As we neared their home Julia asked me if I was going to stop. Just last night as we were eating dinner she had received a phone call that José had experience a very bad seizure. I told Julia that I would stop if she wanted me to but I could not give the family much hope. The social workers at Hermano Pedro had already met with me and told me that since his father had taken Jose home against the doctors wishes the would likely never accept him back there. I told Julia that if she wanted to stop there I would but there was nothing more that I could do. She told me that she felt the same and perhaps we should not stop. I guess my hands weren’t listening to the conversation though because when I reached the dirt trail that led to their house I found them turning the staring wheel up the trail. We found our selves parking the car and walking in to where he lived. Carlos who had agreed with us that we were right in not going to see this family also joined us. Jose’s father and mother were both sitting on the porch of their dirt floor sod home. The mother was holding their tiny 4 year old son in her arms. As the spoke their love for their son became very evident. Jose’s father explained to us how hard it was to leave their only child who they fear was dying at a hospital that was a days buss ride from where they lived. He also shared that the day he had come into Hermano Pedro to visit his son he discovered that they owed the hospital more money than he had ever seen. Granted it was just a token amount of what the child’s actual expenses was, but to this father it could just as well had been a million dollars. He also told us that when he saw his son he was running a high fever and didn’t look any better then he did when they had left hem there several months before. He felt that the hospital had done all that they could do to keep his son alive but also felt that his son was dying. He and his wife made a decision to take tier son home so that he could be with a family who truly loved him. They were praying that their son would live but felt that his future was truly in God’s hands. I thought to myself who were we to disagree with that. Before I could speak Carlos spoke. I could not catch most of what he was saying but could here from the tone in his voice and see from the tears in his eyes that he was speaking from his hart. While he was speaking Julia got up and walked away wiping tears from her eyes. When he had finished I asked him to interpret word for word what I had to say to the family. When I had finished Carlos looked at me and said. “Now they have heard the same thing from both of us.” The family now knows that we are there for them as friends and are in full support of what ever decision they make concerning a son that they truly love. Who are we to say what is right or wrong until we have walked in their moccasins. Today we were unable to find a church to attend but we rested and reflected on some of the ways that we saw God working this past week. We also witnessed some of his creation when we took a drive to Champey. Carlos had never been there before and he awe stricken by its beauty. The motel that we stayed at last night was a bit higher priced than the 8 dollar ones that we have been staying at but since we are now through recruiting and now vacationing we figured that spending $20 per room would be OK. Fact is we liked this place so much that we came back tonight. During supper we met the manager who became so interested in the wheelchair ministry that he has invited us to breakfast in the morning. He has already told me that if we ever need a comfortable place for our distribution teems to stay at he will give us a great rate. His wife wants to meat with us as well because she wants us to meat a little girl who is in need of a wheelchair. I know we had fully intended an taking it easy for the next few days but who says that you can’t mix business with pleasure, Especially when what you do is such a pleasure. Any way I am going to cut this one short and say goodnight. I am finally back home and camp recruitment is officially over for the year. This morning we drove in about 45 minutes from the main road to visit Kenneth and his family. Kenneth is an 8 year old boy who received a wheelchair from us about 3 years ago. We went in to see him a few months later because we felt that he could perhaps learn to use a walker. Today we were surprised to see him not only using the walker that we gave him but he is now able to take a few steps on his own. In fact when I sat down on a chair near him he let go of the walker and gave me a big hug thanking me for having given him the walker. I was surprised that he still remembered me from several years ago. Once we left his place we headed for home. We had intended on taking paved roads and going through Guatemala City on our way home but Julia had left some key sin my car so we headed back through Rabinal. A few days ago when we had driven from Chemaltenango to Rabinal we had encountered a section of road that was so muddy that I scarcely made it through with my Toyota. We discovered today that a few minutes after we had gotten through some vehicles had gotten stuck and the road remained blocked until yesterday. Never again will I complain about any of the hotels that we stay in considering that we could have spent several days sleeping in my car. Both Carlos and I had a good time while we were on the road but it is good to be able to stay home for a while. When I told the kids, who had quickly filled my house, that I would now be home more they all cheered.